The singer - recovering from an operation to save her voice - released her second album just 10 months ago, making the feat even more impressive. It overtook the late Amy Winehouse's Back To Black, which landed the record a little over three months ago. The new record of 3.4 million sales was confirmed today by the Official Charts Company. Amy's album took five years to get to its present 3.3 million sales level, and its success was partly due to the further sales boost following her death in July. 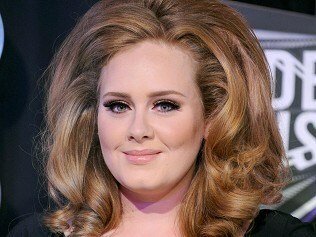 Adele's 21 has not left the top 10 since its release and has been on the chart for 45 weeks. The album was given a further push in the wake of six Grammy nominations last week, including album of the year. In a message posted on her blog over the weekend, the singer - who had an operation on her voice last month - said she was "lost for words" at the Grammy recognition. "A couple days after finally being able to talk again I'm pretty speechless," she said. "This has been the best year as it is but to end 2011 with this incredible achievement and honour is beyond anything I can express." Thanking fans, she added: "This record has taken on a life of its own thanks to you. I made the record and you've made it what's its become."